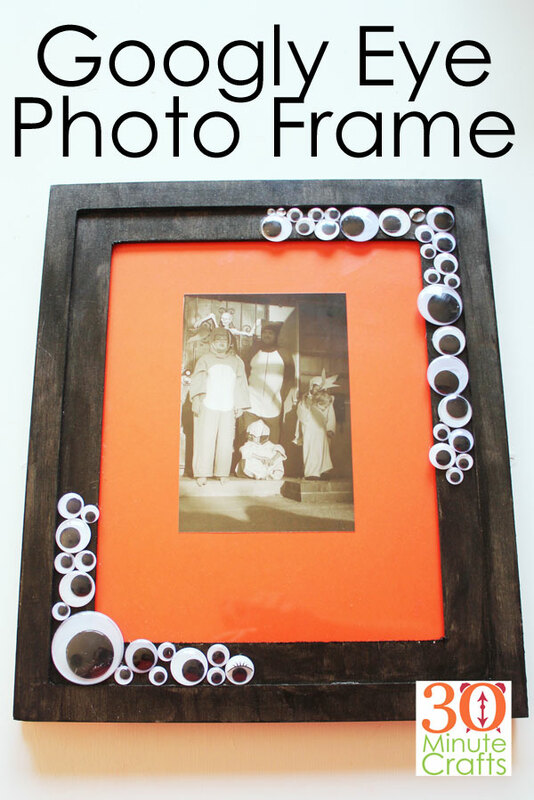 If you’re looking for a fun way to display Halloween photos, look no further than this DIY Googly Eye Photo Frame! 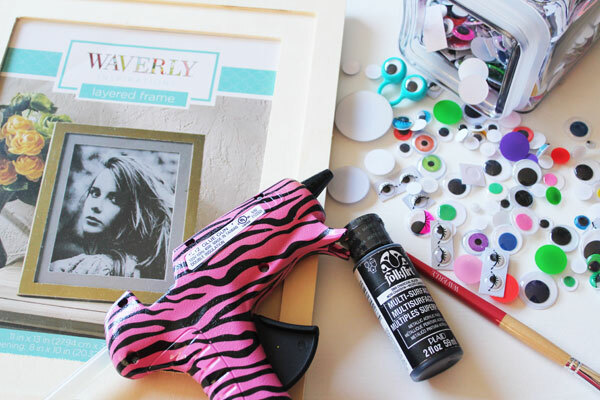 Googly eyes are so much fun to add to the frame, and give great dimension and interest, without a lot of expense. 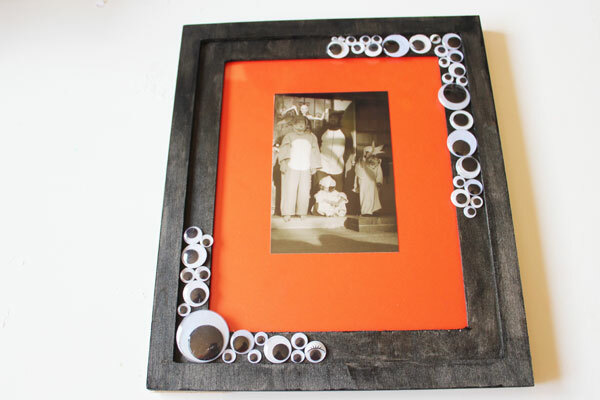 Make different fun Halloween frames each year to display your family’s annual Halloween Costumes. You’ll love putting up the photos each year to reminisce your fun costume ideas! 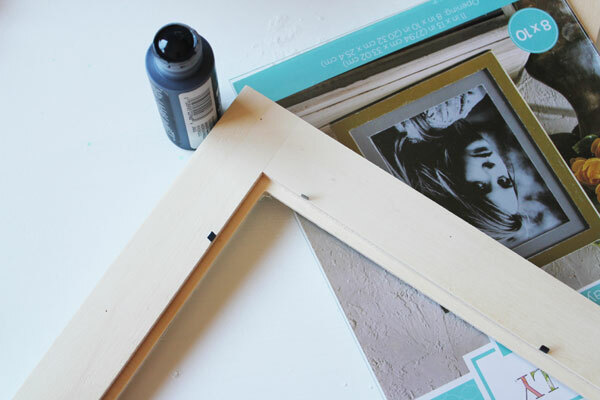 Start by taking apart the frame. This way you don’t have to worry about getting paint on the glass. And you have to remove the back later when you add the photo. So go ahead and remove it now. 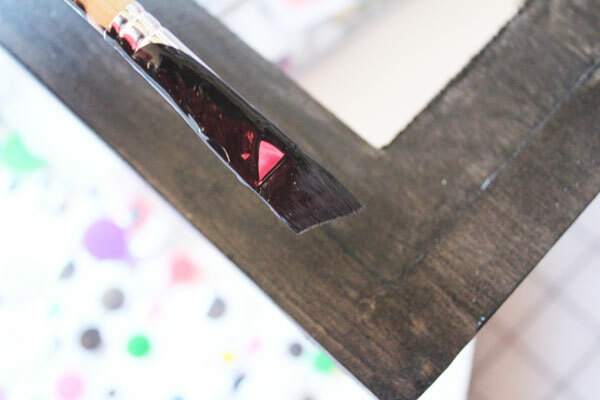 Paint the frame black. I like to remove the lid off the bottle, and dip the brush in. This keeps me from having to clean off a plate later, and prevents any wasted paint. Allow the paint to dry, then hot glue the eyes on. Glue as few or as many as you like. 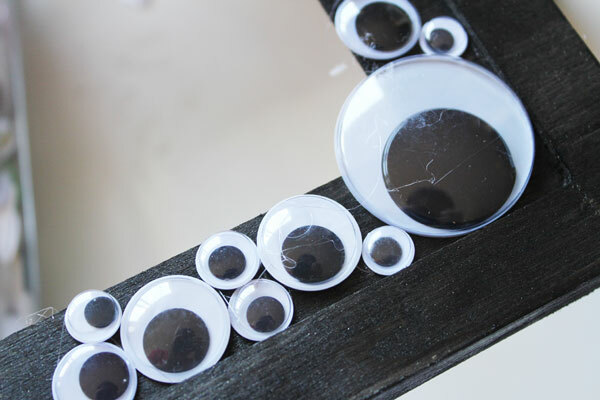 I kept it simple by gluing googly eyes to opposite corners. 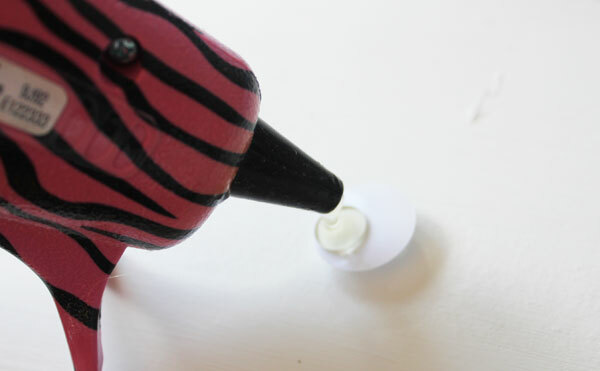 If you have hot glue gun strings, you can use a hair dryer to melt them away. Add a Halloween photo. I printed a photo of my kids in their Pokemon Costumes from last year in sepia tones to make it a little more “spooky.” And I used orange scrapbook paper behind the photo for some contrast. You might want to add a year, the city the photo was taken in, and names of the people in the photo (or what they are dressed as) if you are using the Googly Eye photo frame as a way to memorialize this year’s Halloween costumes. If you’re looking for more fun projects using googly eyes, check out this googly eye necklace, googly eye headband, and googly eye dice!